It’s easier to learn on paper, because reading on paper is up to 30 percent faster than reading online. Nearly 60 percent of senior executives prefer print versus online information. Three out of four people have made a purchase as a result of direct mail. After rising steadily in the 1980s and ’90s, worldwide paper consumption per capita has plateaued in recent years. In the richest countries, consumption fell 6 percent from 2000 to 2005, from 531 to 502 pounds a person. The distressed housing market resulted in weaker demand for lumber in the United States, causing lumber prices to drop by an average of six percent in 2007 compared to 2006[…]. In response, sawmill operators struggled to cut costs, resulting in a number of mills reducing production or shutting down entirely. The reduced lumber production also impacted the availability of wood fiber to the pulp industry. As a result, by the end of 2007, pulp prices were close to their historic peak, which dates back to 1995. Unfortunately for Domtar and other paper producers, paper’s high cost combined with growing awareness of sustainability issues made it a target for elimination from the workplace. The paperless office may yet arrive, in increments anyway. 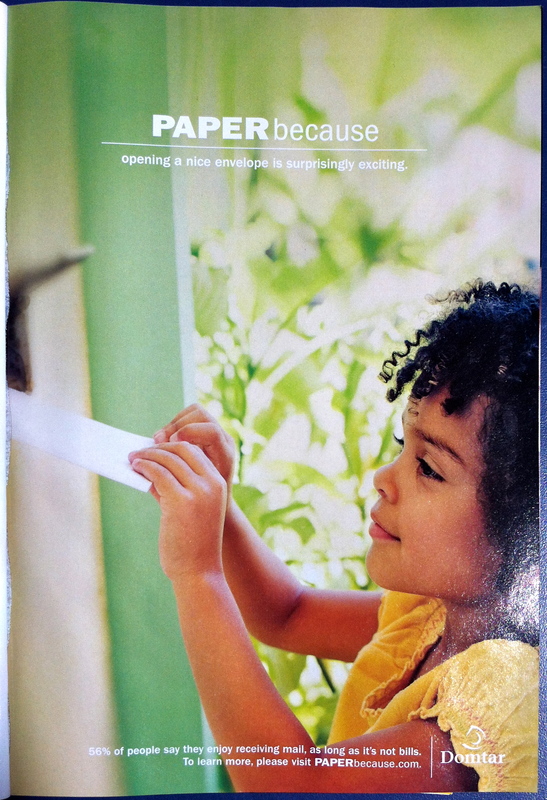 Corporate sustainability reports now highlight reduced paper consumption. Allianz claims a 23% decrease from 2009 to 2010, while this unknown company achieved a 28% decrease from 2007 to 2009, though Societe Generale is aiming for more modest cuts. These changes in paper consumption patters could have far ranging effects. Do the above companies need file cabinets or similar office equipment in the same volume that they did in the years before? As we shift to online billing, ebooks, and read our news via the internet, rather than in newspapers and magazines, what becomes of the commercial printing operations those activities once depended on? It’s easy to imagine significant pricing pressures on the companies that serve the needs of paper consumers — printers, bulk mail operations, etc — as they look for new customers to replace those they’re losing. Falling prices will shake some operators out of the market and largely discourage others from investing in technology and infrastructure improvements. Over time, the companies that serve them will face similar economic pressures. Already, Quark, the company behind the once essential page layout tool for print media, has been sold. What all of this adds up to: printing will get cheaper…until it gets dramatically more expensive. Extra: a TV spot for Domtar’s campaign.